The Khulna-Satkhira coastal belt is one of the most vulnerable areas in Bangladesh in terms of access to safe drinking water, mostly because of salinity problem. 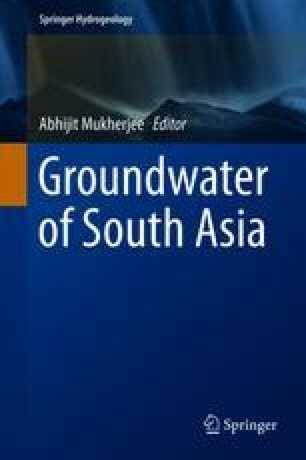 In order to cope with the ever-increasing demand of fresh water in this area, managed aquifer recharge (MAR) has been proposed as an alternative, cost-effective, and disaster resilient option for fresh water supply particularly during the dry period. GIS analysis has been conducted to identify the areas suitable for MAR. Different physical, physicochemical, hydrogeological, geochemical, social, and economic criteria have been investigated in the field for designing and construction of test sites. Four injection wells of 22 or 12 inches diameter have been drilled to a depth of 60–75 ft at the infiltration sites using locally available materials and drillers. Pond water has been pumped or rooftop rainwater has been channelized to an infiltration tank set with a sand filter to remove turbidity and to provide a total head of about 3 ft above the shallow water level. Water has been distributed to various wells through PVC pipe network fitted with stop valves and water flow meter. Water has been allowed to infiltrate into the wells using gravity. Significant reduction of groundwater electrical conductivity and major dissolved constituents of concern such as chloride, arsenic, and manganese have been documented after the infiltration of fresh water into the shallow brackish aquifer. The findings of this study clearly demonstrate that MAR is feasible in the coastal belt of Bangladesh.